Messages that appear in various areas of your check out pages and customer notification emails can be managed though the "messages" page in your Site Manager. This will lead to a page with a complete listing of the "messages" on your site.These messages will appear in various areas throughout your site. You may also edit an individual message directly from the site if you are logged into your site manager. While logged-in, each message that appears on your site will have an "Edit Message" link that appears below or beside the message. To edit individual messages directly, locate the message that you'd like to edit and click the "Edit Message" link. 1. To edit messages, you will first navigate to the "edit message" page. You may use the method shown above, or simply click the "messages" link in your site manager. From here, you can use the Mighty Merchant text editor to customize these messages. Below is an example of the "Edit Message" page. Note the text area has a utilities bar located above it with tools similar to popular Word Processing software. For more information and instructions on the functionality of this text editor, click here! Below you will find a listing of the most common messages in the Site Manager as well as what they are used for and where you might find them on your website. A 404 error message, also known as a "Page Not Found" error, is the message that is displayed if a customer tries to go to a URL on your website that does not actually exist (example: typo in the URL). This is the area of your header where your logo goes. This is often an image and not a text message. You may edit or change the image used by using the image button in your text editor toolbar. 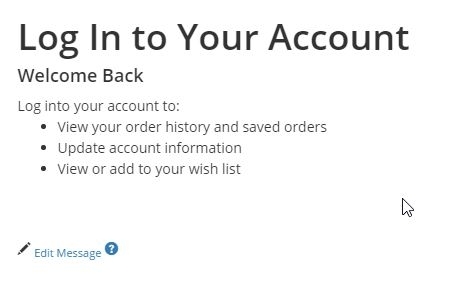 This text will appear before the "New Account" form on your site for retail customers if your site has accounts enabled. This text will appear before the "Wholesale Account Request" form on your site for retail customers if your site has accounts enabled. This message appears on the page that is displayed when a visitor to your site successfully logs-in to their account. This is a more detailed message that prompts users to sign-up for your email newsletter when they are checking out or signing up for an account. This message appears once a Retail Customer successfully signs up for a Retail Account. This lists the benefits of registering for a Retail Account on your website. This is the message header that introduces the featured items on your homepage. This is the message that controls the header text for the checkbox that users can click to sign-up for the email newsletter. This message will appear in the pop-up box that is shown when the user clicks "Shipping Info"